Our first camping holiday conversation was sparked a few years ago, after spending a week in a cottage in Cornwall, with a group of friends. It was during this holiday that I began to suspect that I was pregnant with child number two. During the nine hour journey back home, in our extremely cramped Mini, the idea started forming that we might need to buy a larger car. One which would be suitable for summer camping holidays if we wanted to continue having a winter holiday in South Africa most years. 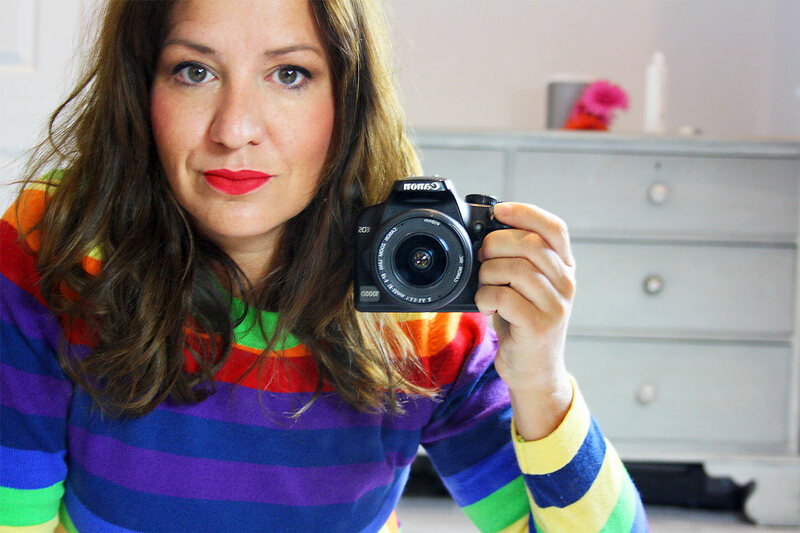 I had camped at festivals a few times, but the first time I did that, I was a little reticent to go and quite frightened by the prospect once I’d agreed. Sleeping on the floor? No mod cons? Why would anyone do such a thing? 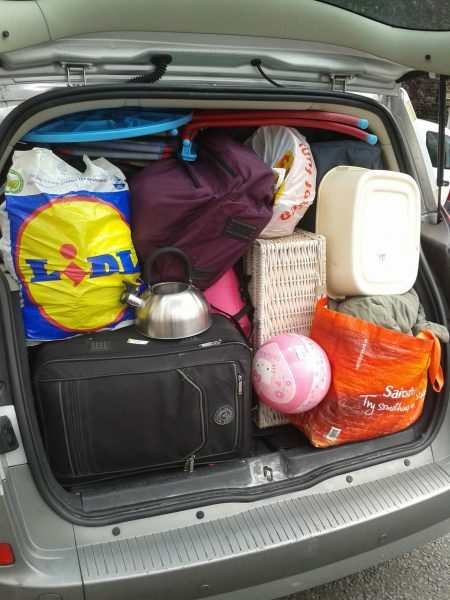 Not long after Haribo’s birth, with the camping conversation in mind, we traded our beloved Mini for the great big hulking beast that is a Renault Grand Scenic. From one extreme to the other. I cried a little the first time I had to drive the Grand Scenic. My life as the mother taxi service in an unsexy bus had truly begun. My Mini was fast and zippy and a dream to manoeuvre, the Scenic could only reach 70mph if you pushed the accelerator all the way down and all passengers in the car leaned forward and farted simultaneously. A year after getting the Beast, with no big camping trips under our belts, and an invitation to a wedding in Dorset, we decided that we would attempt our first solo (family of four) camping trip by planning a week in Woolacombe Bay. Whilst preparing for our first fully fledged family camping trip, extracts from a book I had read (The Tent, the Bucket and Me) keep ominously popping into my head. Disaster courting, calamitous husband. Check. Never constructed the tent ourselves. CHECK. For some reason we decide to pack a small fridge for our week of camping in our desperate attempt at mod cons. Never mind the amount of space it takes up in the car, we have an electric pitch, who needs to see out of the back? Top speed with fully loaded car expected to be 40 mph and we’re only leaving 4 hours later than planned. 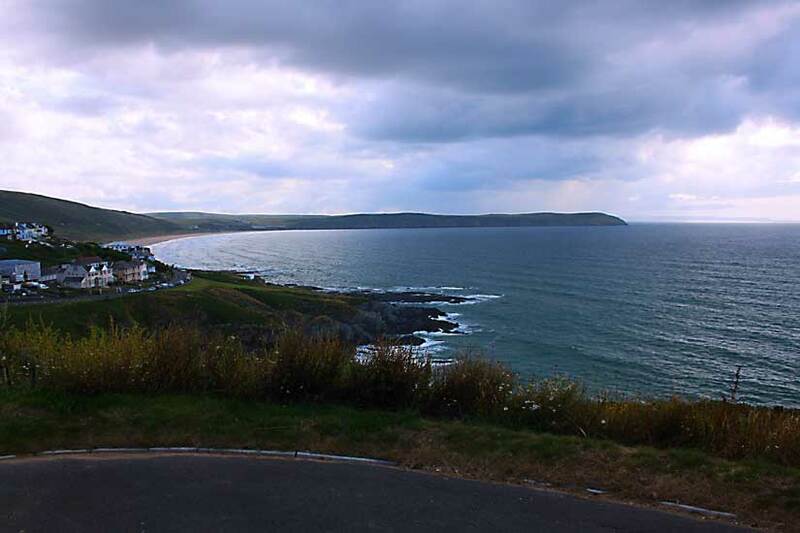 We arrive in Woolacombe Bay early evening with the wind blowing ferociously, an omen of things to come. The children are psychotically hyperactive from 8 hours in the car and it’s nearly dinner time. Perfect conditions for erecting a tent. A tent for which you still need to read the instructions (in the howling wind), because more technically skilled people volunteered to do it the previous time the tent was used (because clearly we looked under qualified). The strong winds grab hold of the tent each time we try to lift it, the children are wild, stress levels are out of control. Why didn’t we practise putting the tent up before we came? I find crisps for the children and bottles of cider for the adults to help lower the raised cortisol levels. Or at least to stop the kids from running over the tent we’re valiantly trying to erect. Fortunately a kind gentleman from the motorhome next door takes pity on us when he sees our chaotic pitching efforts and comes over to help. As Calamity lifts the poles to raise the tent off the ground, we watch as one of the seams of the tent rips into an enormous gaping hole right over the sleeping area. The tent repair kit is not quite designed for a hole of this size, so I attempt to sew a few pieces together whilst Calamity goes in search of an electric cable. My needles have been brought along to finish my dress for the wedding, to sew a lace bodice. Nothing quite as robust as tent fabric. Unsurprisingly, the needle breaks and I discard the broken needle into one of the empty cider bottles. At least, I assumed that it was an empty bottle. Calamity returns with the electric cable and relieved that the (holey) tent is up, albeit less than watertight, he takes a big gulp from his cider. Almost swallows the needle, cursing me as he spits it out. He is not quite so lucky with the wasp that was having a little dip in there. 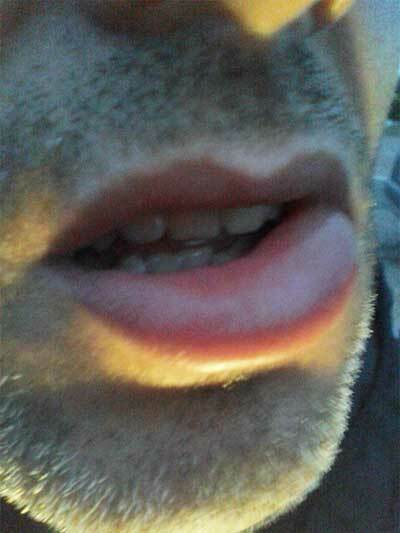 Pete Burns would have had fat lip envy. Mostly uneventful apart from an Oscar winning meltdown from Mayhem. Enjoy sunshine, swimming an outdoor nap and a BBQ. Hole in tent almost a distant memory. But then the rain arrives. Somehow, with the use of a UV pop up tent, duct tape and a piece of the tent pole bag, we manage to stay mostly dry. In view of the non-stop rain, we decide to do a supermarket run. 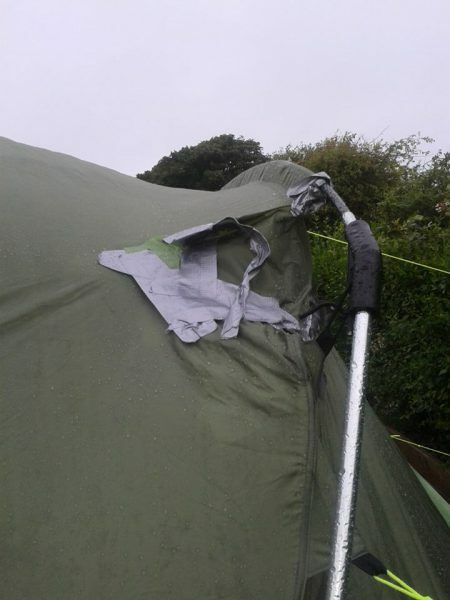 Some tent repair equipment might be nice. Calamity had been sitting in the car listening to the radio, trying to keep the kids dry. The kind neighbour who helped us get the tent up, offers us a jump start. Calamity can’t get the bonnet open. Call the AA. The day begins at 2am with Haribo vomiting. In the tent. In the dark. I manage to get him to the tent living area for the bucket. Miss the bucket. Vomit streaks everywhere. Look for the torch and step in something warm that oozes through my toes. On the bright side, it warms up later in the day. Hole worry almost forgotten. In fact, it’s probably a useful airvent for the smell. Spend a good part of the day searching for 8 hour cream for my blistered lips after Mayhem tells me I look like a clown with Sudocreme on half of my face. Nonetheless, a clown is better than a leper. Then Calamity says I look like Shane Warne. The beach can wait. Lovely sunny day at the beach, when we eventually get there, without 8 hour cream. Never seen quite so many (pale skinned turned beetroot) bodies on one beach. No disasters to report. Lamb on the BBQ. Red wine. What more could one want? Other than brick walls and a real bed perhaps. On the drive down to Devon, Calamity looked around and said: “I wonder why it’s so green here?” I looked at him and thought: “I wonder why you’ve packed the kids 7 sunhats, but we didn’t bring a raincoat or umbrella”, but refrained from saying anything. I think nature answered his question last night. Thunder, lightning and torrential rain. For hours and hours. All night, battering our wonky, holey tent. Two more nights in the tent hoping that my duct tape and handsewn patch will survive the night time assault and battery. Sunny for now, but have bought umbrella. Calamity said we wouldn’t need wellies. The tent chapter is thankfully OVER. It has been raining solidly for 30 hours. Everything is soggy. We decide to abandon the tent. 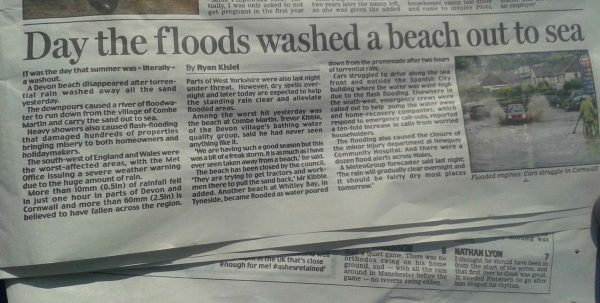 Memo for future holidays: never ever opt for another UK summer holiday. Ever again.